I have this incessant need to make peanut butter things and that was the inspiration for this PB&J Pancake Breakfast Sandwich. If you are looking for unique breakfast ideas for kids, look no further… This peanut butter pancakes recipe is all that and healthy too! This need to make peanut butter things began when my kids started school and peanut butter became the forbidden food. Don’t get me wrong, I am not advocating that we start sending peanut butter to school again. Nut allergies are real and scary and I completely hold up my end when it comes to keeping it at home and the kids safe at school. But I still can’t help but yearn for the days of peanut butter freedom. When I was a kid, peanut butter was everywhere. We ate peanut butter on toast and my Mom made peanut butter cookies and those really gross peanut butter marshmallow squares thingies (that some people seem to like). Then we took those peanut butter thingies to school and shared them with other kids -without their parents’ permission! My brother was so obsessed with peanut butter that when he tried to run away at the age of 5, all he packed, besides a couple of pairs of gonch and some stuffies, was a jar of peanut butter. To me, peanut butter is as much a part of childhood as playing hide n’seek. Yet my kids never think to eat it. That was also part of my inspiration for this pancake breakfast sandwich recipe. The fact that the contest rules dictated that it had to be healthy was kind of an added bonus. 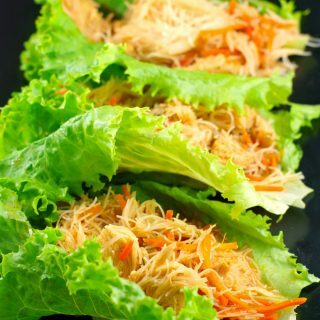 This recipe was a runner up in the 2012 “Destination Hotels Healthy Kids Contest,” which was a contest judged entirely by kids. And my kids really like it too! 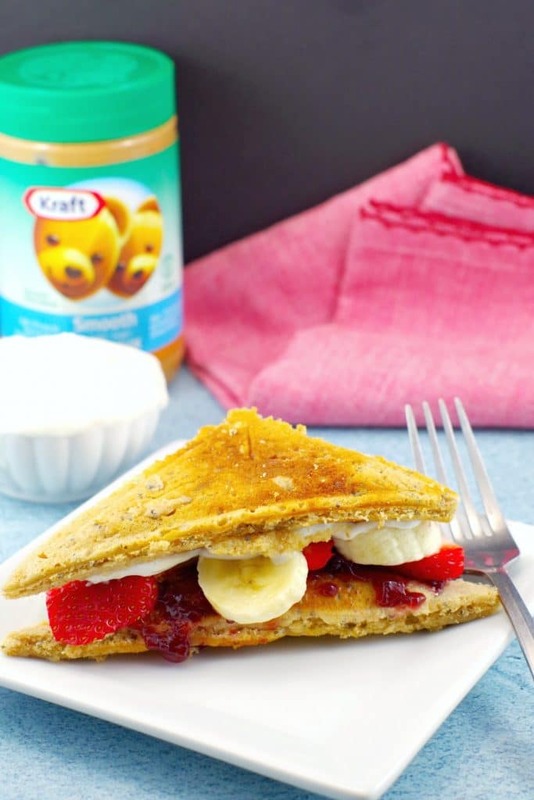 Plus, pancake sandwiches are simply more fun than plain ‘ol pancakes! * I use a sandwich maker, but you could use a waffle maker or simply use pancakes and cut them into desired shapes. Why not set it out on a tray and let the kids make their own? Now that’s FUN! Give this Strawberry Gingerbread Pupcake a try! It’s also more fun than boring old pancakes, is freezer friendly and can be made ahead! 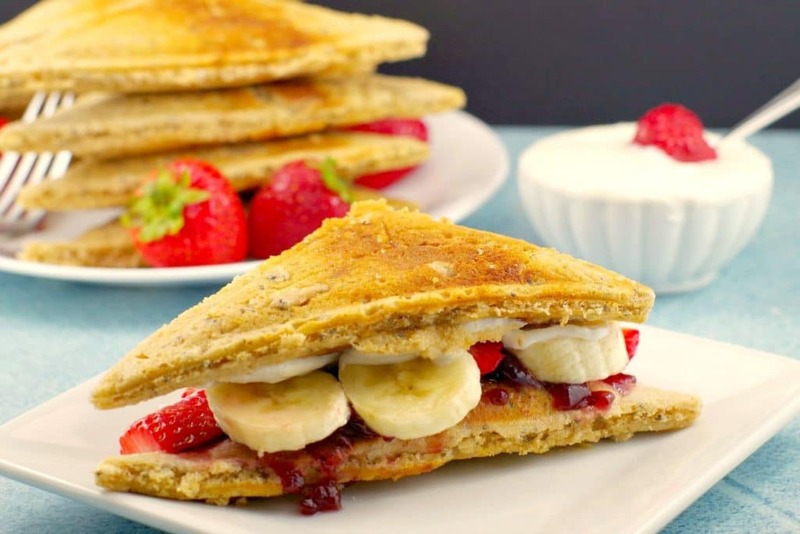 This award-winning and healthy PB&J pancake breakfast sandwich is fruit, jam and yogurt filling, sandwiched between two peanut butter pancakes. It can be made with a sandwich maker, a waffle iron or pancakes can be cut into desired shapes. Heat sandwich maker and spray with non-stick vegetable spray. In a large bowl, mix flour, oats, baking powder, baking soda, sugar, and flax together. In a separate medium- sized bowl whisk peanut butter, egg, egg white, vanilla, oil and milks together. Mix dry ingredients with wet. Remove with a spatula when done and repeat with remaining batter until all gone (ensuring to spray non-stick vegetable spray each time). Spread 1 tsp. jam on one ½ sandwich pancake and 1 tsp. maple yogurt on the other. 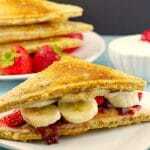 Add layer of strawberries and bananas (about 5- 6 slices of each) on top of jam covered pancake. Place the maple yogurt-covered pancake on top. Serve with maple vanilla yogurt for dipping sauce. ***FAT: I use low-fat peanut butter, but this was not available on my nutrition label. With low-fat peanut butter, the fat in this recipe is substantially reduced. 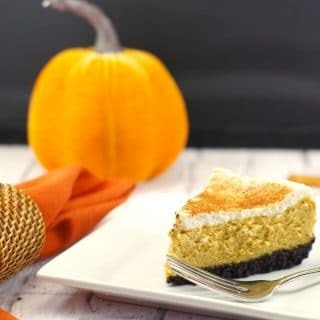 This post is part of Tasty Tuesdays Link up party!